Phra Krubah Seewichai was born on 11th September BE2421, in the province of Lampoon (North Thailand). On that day, there was a thunderstorm with lightning. When Phra Krubah Seewichai was born, the sky suddenly turned clear and sunny. There was a monk called Krubah Katdtiya, who was on tudong in Lampoon. When Krubah Katdtya arrived at a place in Lampoon called Bahn Pahng. At that time, there was no temple at Bahn Pahng. The villagers, upon seeing a monk dutong passed the area, they quickly built a small hut for him and requested him to reside in their village. Phra Krubah Seewichai, at that time, was a teenager and together with his friends ordained as Naen (novice monk) under Krubah Katdtiya. He learned everything under his teacher Krubah Katdtiya. When Phra Krubah Seewichai was 25 years old, seeing that his family was poor, wanted to leave monkhood and helped support the family. However, his parents forbidded him. His parents asked him to visit a monk called Krubah Samana, who was a very wise monk, so as to seek this monk advice before leaving monkhood. Phra Krubah Seewichai followed his parent's instructions and visited Krubah Samana. Krubah Samana advised him not to leave monkhood and asked him to visit Krubah Upala at Wat Doi Dtae. When Phra Krubah Seewichai reached Wat Doi Dtae, he asked Krubah Upala for advice. Krubah Upala taught Phra Krubah Seewichai the Dhamma and Sammahdti. After receiving all the teaching from Krubah Upala, his thoughts of leaving monkhood vanished. One day, one villager gave some meat to Phra Krubah Seewichai. After Phra Krubah Seewichai consumed, he vomitted and fell ill. Since then, everytime he consumed meat, he would vomit and fall ill. From then on, he became a vegatarian and stopped eating meat. At BE2427, Phra Krubah Seewichai helped Krubah Kadtiya to build a temple at Bahn Pahng. When Krubah Kadtiya passed away, Phra Krubah Seewichai became the abbot of the temple. Phra Krubah Seewichai observed a very disciplined rountine daily. He woke up at 5 am to sweep the temple's compound. Then he would perform chanting. After which, he would go for alms in the village. In afternoon, he would teach the villagers, novice monks and children, the Buddha's teachings. In the evening, he would perform chanting again and practice sammahdti. He stayed in the temple and hardly left the temple. Phra Krubah Seewichai became very thin, because he stopped consuming meat. The villagers seeing that, respected him and offered him many expensive gifts, but Phra Krubah Seewichai just passed the gifts to the poor village people. He was contented with a meal of small lump of rice with a little vegetables each day. After became a monk for 11 years (BE2450), Buddhism was gaining more popularity in Thailand and many people became monks. The government established some rules to control the people becoming monks. One of the rules was that, whoever wanted to ordain, had to apply for permit from the province head. Many people in Bahn Pahng wanted to ordain as monk under Phra Krubah Seewichai. Phra Krubah Seewichai applied the permit for them to be ordained. However, after waiting for a few months, there was no reply from the province head. Phra Krubah Seewichai, felt that as long as the parents of the person had given permission for his son to be ordained, it was alright to ordain him even there was no permission from the province head. He went ahead and ordained many people in the village without permission. The province head came to know and was very furious, saying that Phra Krubah Seewichai was arrogant and did not respect authority. Phra Krubah Seewichai explained to the province head, and finally forgiven. However since that time, Phra Krubah Seewichai had to asked for permit for people to be ordained as monks frequently as there were many people wanted to be ordained under him. 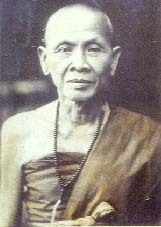 Phra Krubah Seewichai was unable to attend meetings held by the Buddhist Council, because he had spent most of his time practicing Sammahdti. This caused the head of the Buddhist Council in Lampoon very angry and punished Phra Krubah Seewichai by sending him to become a normal monk in Wat Pratahirikonchai thus stripping him of his abbot appointment in Wat Bahn Pahng. Phra Krubah Seewichai accepted the punishment without questions and stayed in Wat Pratahirikonchai, practising Sammahdti and never left the temple for one year. When he stayed in Wat Pratahirikonchai, he was again being complained of not obeying to the abbot of Wat Pratahirikonchai. Phra Krubah Seewichai was chased away by the abbot. The abbot also informed other temples in Lampoon, not to accept or let Phra Krubah Seeiwchai reside in their temples. A monk called Phra Maha Samana Chow heard of Phra Krubah Seewichai's plight, and wrote a letter to Phra Kongmeunchinworn and asked why this had happened to a good monk like Phra Krubah Seewichai. Phra Kongmeuanchinworn went to investigate and could not find any faults of Phra Krubah Seewichai. He asked Phra Krubah Seewichai to follow him to Bangkok and see Phra Sangkaraht (Chief Monk of Thailand). On the day, he went to Bangkok, there was a huge crowd to send him off. When he reached Bangkok, he stayed in Wat Benjamabopit. Phra Sankaraht asked him about the whole issue, and found that there was no faults committed by Phra Krubah Seewichai. Phra Sangkaraht allowed Phra Krubah Seewichai to return and stay in any temples in Lampoon as he wished. On 21st July BE2463, he went back to Lampoon. There was a huge crowd again to receive him at the train station. Phra Krubah Seewichai stayed in Wat Bahn Pahng. From then on, Phra Krubah Seewichai started to help build temples around Lampoon areas. One day, Phra Krubah Seewichai thought of Wat Pratahirikonchai and remembered that the temple was in bad condition as he used to stay there for a year. Phra Krubah Seewichai wanted to re-build the temple and also build a chedi. When people heard that he wanted to do these things, there was huge support and donation poured in. In BE2763, Phra Krubah Seewichai built a new chedi called Prataht Doi Geung in Chiangrai Province. He spent only 2 months building the Prataht because there was support and funds from the people. Whenever Phra Krubah Seewichai wished to build temples or Prataht, there would always have huge support and funds because a lot of people respected him. On 9th November BE2477, Phra Krubah Seewichai started to build a road up Doi Suthep where there was temple that housed the relics of Buddha. He spent a total of only 5 months and 22 days to build the road as there were a lot of people came to help, digging through the forests, rocks and soil from the hill and finally, making a road up to Wat Doi Suthep. Support came from Chiangrai, Phayao, Lampang, Lampoon, Phae, Nan and almost all the provinces of North Thailand. On 30th April BE2478, the road to Wat Doi Suthep was completed. Since BE2451 to BE2481, in monkhood for 30 years, Phra Krubah Seewichai never had anything belonged to him, he spent time helping and building temples and things that are good. Phra Krubah Seewichai passed away because to ill health (due to the toil of building temples and helping the welfare of people) at the age of 60 years old on 22nd March BE2481.